Optimal strategies for genetic improvement in crops depend on accurate assessments of the genetic architecture of traits. The overall objective of the present study was to determine the genetic architecture of anthracnose fruit rot (AFR) resistance caused by the fungus Colletotrichum acutatum in the University of Florida strawberry (Fragaria × ananassa) breeding germplasm. In 2016–2017, 33 full-sib families resulting from crosses between parents with varying levels of AFR resistance were tested. In 2017–2018, six full-sib families resulting from putative heterozygous resistant parents and homozygous susceptible parents were tested. Additionally, a validation population consisting of 77 advanced selections and ten cultivars was tested in the second season. Inoculation was performed using a mixture of three local isolates of the C. acutatum species complex. Phenotypes were scored weekly, and genotyping was performed using the IStraw35 Affymetrix Axiom® SNP array. A pedigree-based QTL analysis was performed using FlexQTL™ software. A major resistance locus, which we name FaRCa1, was detected in both seasons with a peak located at 55–56 cM on LG 6B and explaining at least 50% of the phenotypic variation across trials and seasons. The resistant allele exhibited partial dominance in all trials. The FaRCa1 locus is distinct from the previously discovered Rca2 locus, which mapped to LG 7B. While Rca2 is effective against European isolates from pathogenicity group 2, FaRCa1 appears to confer resistance to isolates of pathogenicity group 1. Communicated by Christine A. Hackett. The online version of this article ( https://doi.org/10.1007/s00122-018-3263-7) contains supplementary material, which is available to authorized users. Optimal strategies for genetic improvement in allo-octoploid (2n = 8x = 56) strawberry (Fragaria × ananassa) depend on the genetic architecture of target traits (Whitaker et al. 2012). Accurate estimations of heritability and of the number, locations and effects of loci controlling traits are the basis for strategic decisions in breeding programs (Moose and Mumm 2008). 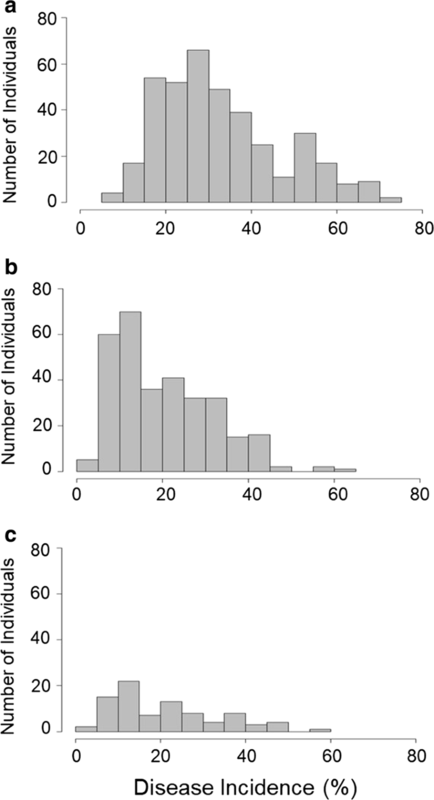 For efforts to discover and characterize genetic loci, three characteristics are important: population type, statistical methodology and molecular resources available for a given species. Biparental segregating populations have been predominantly utilized for QTL analysis in cultivated strawberry. Economically important fruit quality traits (Lerceteau-Kohler et al. 2012; Zorrilla-Fontanesi et al. 2012) and flowering traits (Weebadde et al. 2007) in strawberry have been described using biparental populations. Loci associated with disease resistance in strawberry have also been described using biparental populations, including for Verticilium wilt caused by Verticillium dahliae (Antanaviciute et al. 2015), anthracnose caused by Colletotrichum acutatum (Lerceteau-Kohler et al. 2005), crown rot caused by Phytophthora cactorum (Denoyes-Rothan et al. 2004) and red stele root rot caused by Phytophthora fragariae (Haymes et al. 2000). However, limitations inherent to biparental populations can restrict the applicability of these results in breeding programs (van de Weg et al. 2004; Bink et al. 2014). Trait-associated loci and their effects, while significant within a single cross, might not be relevant for broader germplasm. Most fruit breeding programs are characterized by many pedigree-connected clones, complex multi-generational families with variable numbers of progeny and diverse genetic backgrounds (Bink et al. 2002, 2012). To detect loci and their effects across representative genetic backgrounds, it is advantageous to simultaneously analyze pedigree-connected families that represent the full genetic variability of a population (Verma et al. 2017b). Utilizing complex, diverse populations in QTL detection provides additional advantages such as the exploitation of historical recombination events, higher mapping resolution and greater sensitivity for detection of loci with small phenotypic effects (Xu et al. 2017). Recent improvements in statistical methods have been critically important for mapping studies, especially for analysis of complex population structures. Bayesian analysis methods with Markov chain Monte Carlo algorithms are flexible and powerful tools that use bi-allelic or multi-allelic QTL models to estimate chromosomal location, number, mode and magnitude of QTLs in unbalanced population sets (Bink et al. 2002, 2008, 2014). Moreover, the Bayesian approach is appropriate when marker information is incomplete due to use of dominant markers (Bink et al. 2002). The software package FlexQTL™ utilizes a Bayesian pedigree-based analyses (PBA) approach for QTL discovery and characterization via the software Pedimap (Voorrips et al. 2012) and Visual FlexQTL™ (van de Weg et al. 2004, 2015) which support the graphical representation of FlexQTL™ outputs (van de Weg et al. 2004). Loci for economically important traits have been characterized using this software in fruit crops including sweet cherry (Rosyara et al. 2013; Cai et al. 2017), peach (Fresnedo-Ramirez et al. 2015, 2016; Hernández-Mora et al. 2017a, b) and apple (Allard et al. 2016; Di Guardo et al. 2017; Durand et al. 2017; Howard et al. 2017; van de Weg et al. 2017). FlexQTL™ has also been recently utilized in octoploid strawberry in concert with subgenome-specific genetic maps. 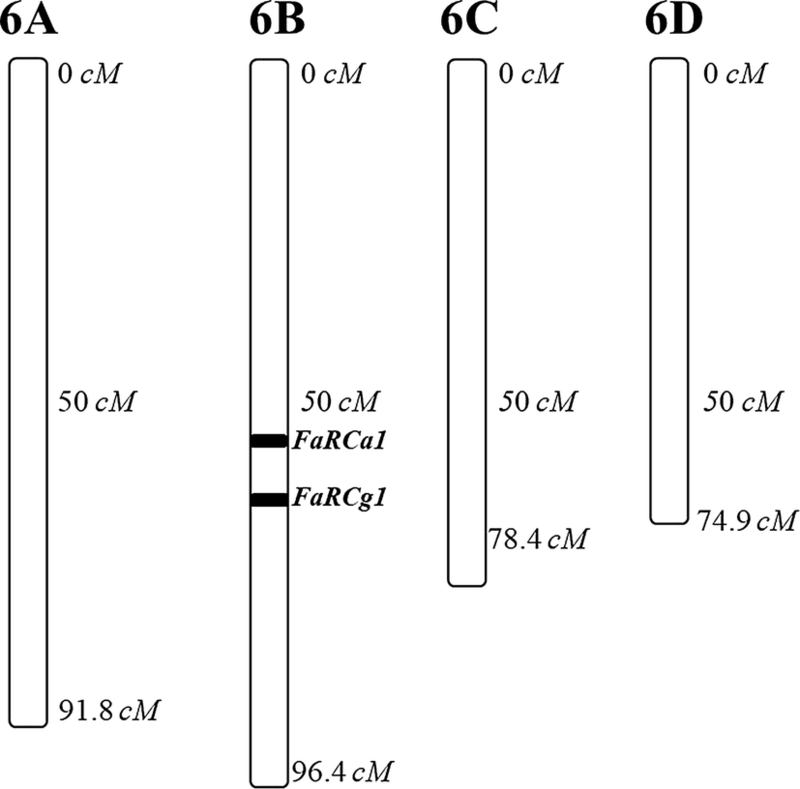 Four biparental crosses were assessed to detect FaRXf1 (LG 6D), a major locus that confers resistance to angular leaf spot (ALS) caused by Xanthomonas fragariae (Roach et al. 2016). A large-effect QTL, FaRPc2 (LG 7D) for resistance to crown rot, caused by Phytophthora cactorum, was characterized in many genetic backgrounds using 139 full-sib families obtained from 61 parents in the UF strawberry breeding germplasm (Mangandi et al. 2017). A moderate-effect QTL, FaRCg1 (LG 6B), explained most of the genetic variance for resistance to crown rot caused by Colletotrichum gloeosporioides in 62 full-sib families in the University of Florida (UF) strawberry breeding program (Anciro et al. 2018). 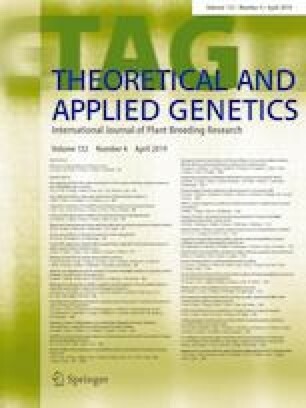 Furthermore, QTLs were detected for soluble solids content (SSC) (LG 6A), fruit size (LG 2BII), pH (LG 4CII), titratable acidity (LGs 2A and 5B) and perpetual flowering (LG 4A) in 23 pedigree-connected families obtained from 11 parents that represent the breeding populations included in the RosBREED project (Iezzoni et al. 2017; Verma et al. 2017b). These results have enabled a robust platform for marker-assisted selection for FaRXf1 and FaRPc2 and future applications for other QTLs present in the UF strawberry breeding program and other strawberry breeding programs (Whitaker et al. 2017). One of the major challenges in strawberry genetics has been the availability of high-throughput, subgenome-specific markers. Since the cultivated strawberry has four subgenomes, each locus can represent up to eight different alleles in a single individual, making it difficult to accurately analyze segregation. Initial progress began with the availability of a reference genome for the diploid (2n = 2x = 14) Fragaria vesca ssp. vesca (Shulaev et al. 2011), an ancestor of the cultivated strawberry Fragaria × ananassa (Tennessen et al. 2014). Based on the alignment of short-read sequences from 19 strawberry accession to the diploid strawberry reference genome, di-allelic and multi-allelic single-nucleotide polymorphisms (SNPs) and indels were incorporated into the 90K Affymetrix® Axiom® array, the first high-throughput genotyping platform for cultivated strawberry (Bassil et al. 2015). The applicability of the 90K Affymetrix® Axiom® array was limited in breeding programs due to high cost per sample (Bassil et al. 2017), and a subset of high-quality genetically mapped markers was chosen for inclusion on the 38K Axiom® IStraw35 384HT array (Verma et al. 2017a). These arrays now provide an abundance of subgenome-specific SNPs for use in genetic studies. Anthracnose diseases caused by C. acutatum are economically impactful in strawberry nurseries and fruiting fields worldwide, but particularly in Florida, where warm and wet conditions provide the pathogen with the ideal environment to cause economic losses (Howard et al. 1992). Growth of C. acutatum is most favorable between 24 and 28 °C (Smith 1990) and during continuous periods of wetness (Forcelini et al. 2017). Such conditions are common during the strawberry production season in Florida. The fungus can survive as appressoria and produce quiescent infections on strawberry leaves from nursery plants where symptoms are usually not observed (Peres et al. 2005). In some cases, infected runner plants might show symptoms on petioles and roots (Mertely and Peres 2012). In the field, C. acutatum spores are dispersed by irrigation, rain, insects and workers (Mertely et al. 2017). Overhead irrigation used to facilitate bare-root transplant establishment is also an important form of dispersal. Symptoms can be observed in runners, crowns, leaves, flowers and fruit. Small black or dark brown spots can be found on green fruit. In ripening fruit, lesions are firm, dark brown and sunken (Mertely et al. 2017). Lesions harbor developing conidia and make fruit unmarketable. Fruit disease caused by C. acutatum is commonly known as anthracnose fruit rot (AFR) in the USA and as black spot in the UK (Simpson et al. 1994; Mertely et al. 2017). Chemical control of AFR is the most common practice in commerce. The protectant multi-site fungicide captan and single-site fungicides within the quinone outside inhibitors (QoI) such as azoxystrobin and pyraclostrobin in the commercial products Abound®, Cabrio®, and the phenylpyrrole (PP) fludioxonil in Switch® are widely used in Florida for anthracnose management (Mertely et al. 2017). However, C. acutatum isolates resistant to QoI fungicides were reported in 2013, limiting chemical management of AFR primarily to captan sprays (Forcelini et al. 2016). For many decades, recurrent phenotypic selection has been applied in the UF strawberry breeding program to improve fruit quality traits (Whitaker et al. 2012) and disease resistance, including AFR. Previous studies have documented broad variability for resistance to AFR in UF breeding germplasm, with most cultivars being moderately to highly resistant (Chandler et al. 2006; Seijo et al. 2008, 2012a, b). While phenotypic selection has been historically effective, it has been less so in recent decades. Summer nurseries have moved out of Florida to temperate locations where conditions are less favorable for Colletotrichum diseases, and fungicides are increasingly used in the UF breeding plots to reduce incidence of several diseases according to commercial practices. As a result, the frequency of resistant genotypes in the UF breeding population has decreased in recent years (unpublished data). Moreover, the ideal scenario for phenotypic selection for disease resistance requires considerable resources for inoculated trials (Moose and Mumm 2008). It would be highly advantageous to utilize molecular tools in breeding for AFR resistance. However, the genetic architecture of AFR resistance in the UF breeding program must first be described. Previous European research demonstrated that a dominant allele at the single locus Rca2 controls high-level resistance to C. acutatum isolate 688b from pathogenicity group (PG) 2 in strawberry (Denoyes-Rothan et al. 2005). Five other QTLs were found to give moderate resistance to the C. acutatum isolate 494a, which was assigned to PG-1, in a cross between ‘Capitola’ and CF1116 (Denoyes-Rothan et al. 2004). Since the Rca2 resistance allele was reportedly present in UF germplasm (Denoyes-Rothan et al. 2005), it was originally assumed that Rca2 was the main resistance source in the UF breeding population. However, molecular markers linked to Rca2, which give resistance to C. acutatum isolate 688b and 1267b from PG-2 (Lerceteau-Kohler et al. 2005), do not explain resistance/susceptibility to AFR in UF cultivars (unpublished data). UF cultivars are a source for AFR resistance in other breeding programs worldwide. The overall objective of the present study was to determine the genetic architecture of AFR resistance in UF strawberry breeding germplasm using C. acutatum isolates collected in Florida. Specific objectives were to: (1) phenotypically characterize AFR resistance in UF breeding germplasm in inoculated field trials, (2) detect subgenome-specific chromosome regions associated with resistance to AFR using pedigree-based QTL analysis in complex, multi-parental populations representing the diversity of UF breeding germplasm, and (3) validate the presence and phenotypic effects of loci associated with resistance to AFR in the parent pool of the UF strawberry breeding program and in widely grown cultivars. A large, multi-parental population set was evaluated in each of two consecutive strawberry seasons. All crosses included were representative subsets of crosses made in the UF breeding program each year, each parent arising from an elite breeding population that has undergone phenotypic recurrent selection for more than 15 generations. The 2016–2017 population set consisted of 33 full-sib families from crosses among 31 parents (Supplementary Fig. 1). Parents were chosen to represent a wide range of disease phenotypes, with resistant × resistant, resistant × susceptible and susceptible × susceptible crosses included. The 2017–2018 discovery population set consisted of six full-sib families from crosses made among seven parents (Supplementary Fig. 2). These crosses were resistant × susceptible and predicted to segregate 1:1 based on 2016–2017 results. From each full-sib family, 4 to 26 seedlings in 2016–2017 (Supplementary Fig. 1) and 42 to 68 seedlings in 2017–2018 (Supplementary Fig. 2) were randomly selected for inclusion in the study. Seeds from each cross were germinated at the UF Gulf Coast Research and Education Center (GCREC) in Wimauma, Florida, in April of each year, transplanted into individual peat pellets and transported to the breeding program’s summer nursery located in southern Oregon in June of each year for clonal replication. Runner plants (clonal replicates) from each seedling were allowed to root, then collected from the nursery as bare-root transplants in September and transported to Florida for evaluations at the GCREC research farm. Four clonal replicates of each individual were planted in a randomized complete block field design (RCBD) with one runner plant in each of four blocks, each block consisting of two raised beds. Eight clonal replicates of each parent and check genotype were planted, one in each bed. Transplanting took place on Oct 10, 2016, and Oct 10, 2017. Eighty-seven individuals consisting of elite selections (77) representing the parent pool of the breeding program and cultivars (10) were evaluated for resistance to AFR during the 2017–2018 season in a separate inoculated trial (Supplementary Table 1). For each selection or cultivar, four plants were planted in each of two blocks (eight total clonal replicates) in a randomized complete block (RCB) design with each block consisting of one planting bed. Transplanting took place on Oct 10, 2017. Isolates 02-163, 02-179 and 03-32 (recently described as C. nymphaeae within the C. acutatum species complex, N. Peres unpublished data) were, respectively, obtained from petiole, fruit and crowns of symptomatic strawberry plants submitted to the GCREC plant disease diagnostic clinic from strawberry farms located in central Florida (MacKenzie et al. 2009). Isolates 02-163, 02-179 and 03-32 were obtained from cultivars Festival, Aromas and Treasure, respectively, in fall 2002 and 2003. These three isolates showed high anthracnose incidence and severity on detached strawberry fruit from cultivar Camarosa (MacKenzie et al. 2009). Inoculum was produced by growing the three isolates separately on potato dextrose agar (PDA) at room temperature with constant light for 7 days until sporulation. Plates were flooded with sterile-distilled water when growth turned orange and reached near the border of the plate. A spore suspension for each isolate was passed through cheesecloth to remove dislodged mycelia. A final suspension was adjusted to 1 × 105 conidia/ml by combining equal concentrations of each isolate. Each plant was inoculated with approximately 5 ml of the final conidia suspension. Inoculations were performed late in the afternoon using a handheld sprayer by placing the nozzle of the sprayer approximately 2 cm above the crown. For the 2016–2017 trial, two inoculations were performed, the first one on Oct 21, 2016, and the second one on Dec 5, 2016. For the 2017–2018 trial, inoculation was performed on Nov 7, 2017. Overhead irrigation was applied after inoculation to ensure leaf wetness for at least 4–6 h. AFR incidence was recorded weekly for 11 weeks starting 12 weeks after the first inoculation in the 2016–2017 trial, and for 8 weeks starting 15 weeks after inoculation in the 2017–2018 trial. All ripe fruits were harvested weekly from all plants, and each fruit was examined visually for AFR symptoms. A fruit was considered diseased regardless of the proportion of the fruit surface affected. The proportion of symptomatic to total fruit harvested was determined for each plant (clonal replication). A mean incidence was calculated across replications for each individual. For the discovery populations and validation population in both years, 30–60 mg of unexpanded leaf tissue from each individual was collected into 96-well plates and frozen at − 80 °C until extraction. Immediate parents and other pedigree-connected individuals with discovery populations were also included. DNA extraction was performed using a modified Integrated DNA Technologies (IDT) Plant DNA Extraction Protocol (Keb-Llanes et al. 2002). Prior to DNA extraction, frozen samples were ground with a Fisher Scientific PowerGen high-throughput homogenizer (Pittsburgh, PA) twice for 1 min with a 3-min refreezing at − 80 °C between grindings. Genotyping was performed using the 38K Axiom® IStraw35 384HT array (Verma et al. 2017a). Genotyping errors were detected by comparing, within full-sib families, SNP calls of each individual with that of the parental genotypes, and replaced with ‘no call’ if not matching possible genotypes. If the correct parent was not obvious, the incorrect parent was replaced with an ‘undetermined’ parent. In addition, markers with inheritance errors, as determined in the ‘mconsistency’ file of FlexQTL™ outputs, were removed from the data and the data re-analyzed in FlexQTL™ until errors were minimized. Preliminary genome-wide association studies (GWAS) for all populations were performed using the GAPIT R package (Lipka et al. 2012) and ~ 38K polymorphic SNP markers anchored to the F. vesca spp. bracteata genome assembly (Tennessen et al. 2014) to survey the genome for regions that may be associated with AFR resistance. Pedigree-based QTL analyses with markers mapped to all subgenomes were performed using a Markov chain Monte Carlo (MCMC)-based Bayesian analysis in FlexQTL™ using a model with additive QTL effects and a maximum number of QTL of 20. The prior number of QTL was set to 1 (Bink et al. 2014), and genome-wide analyses were performed. Each analysis was performed with different starting seeds to create independence between iterations, using simulation chain lengths of 100,000 or 200,000 iterations with thinning values of 100 or 200, respectively. The effective sample size in the parameter file was set to 100. Each of the two iterations converged (effective chain samples, or ECS ≥ 100 for each of the parameters mean, variance of the error, number of QTL and the variance for the number of QTL) as recommended by Bink et al. (2014). In addition to seedlings and immediate parents, pedigree-connected cultivars and selections were also included in the analysis. where wAVt is the weighted additive variance of the trait, adjusted for the portion of the variance explained by the QTL on a particular chromosomal position (obtained after post-QTL analysis), and VP is the total phenotypic variance of the trait. 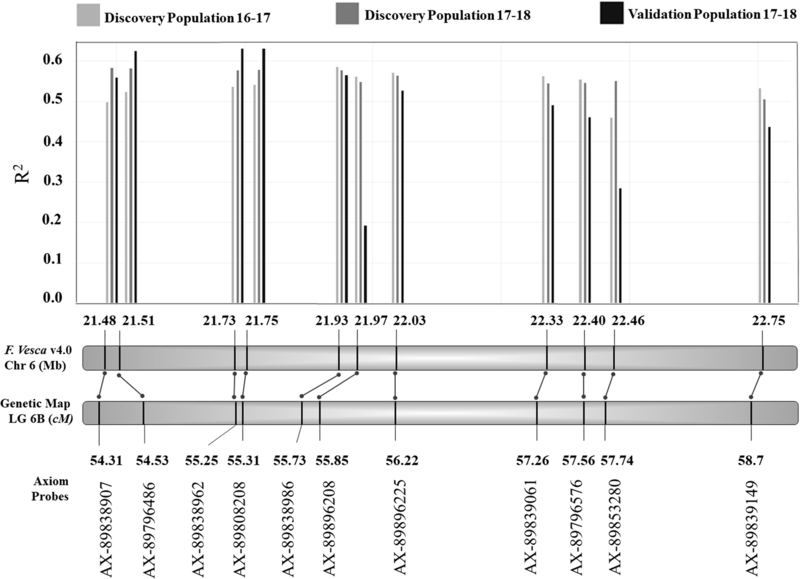 SNPs spanning the QTL region detected in the discovery populations were used in single-marker analyses to independently determine their association with AFR in the validation population. Single-marker analyses were performed for 19 markers using one-way ANOVA in R software (R Core Team 2013). The 19 Axiom probe sequences for these SNP markers were located to the diploid woodland strawberry Fragaria vesca genome assembly v4.0.a1 (Edger et al. 2018) via local BLAST in order to determine the physical positions of the probes. A wide range of phenotypic variability for resistance to AFR was observed in both seasons. Disease incidence for the discovery populations ranged from 6.4 to 72.3% and from 1.6 to 60.1% in the 2016–2017 and 2017–2018 seasons, respectively. Disease incidence for the validation population ranged from 3.4 to 59.4% in 2017–2018 (Fig. 1). Frequency distributions were strongly skewed toward higher values (susceptibility) in both discovery populations and validation population. Full-sib family means ranged from 21.1 to 47.2% in 2016–2017 and from 16.9 to 25.2% in 2017–2018. Means and standard errors for disease incidences of parents, selections and cultivars common in the two discovery populations in 2016–2017 and 2017–2018 and in the validation population in 2017–2018 are compared in Supplementary Table 2. In the 2016–2017 and 2017–2018 discovery population sets, 28,044 and 23,438 polymorphic SNPs, respectively, were obtained. The subgenome-specific mapping and curation process resulted in a final map for ‘FL_08-10’ × ‘12.115-10’ of 9301 SNPs spanning 19.3 Morgan that maximized polymorphism across both discovery population sets (Anciro et al. 2018). In 2016–2017, the mean minor allele frequency (MAF) was 0.26, with 90% of markers having MAF between 0.05 and 0.5. In 2017–2018, the mean MAF was 0.22, with 75% of markers having MAF between 0.05 and 0.5. In 2016–2017, 89% of the 9301 SNPs were categorized as poly-high resolution, presenting all three possible SNP genotype classes (AA, AB and BB), 10% lacked one of the homozygous genotype classes (so-called no-minor homozygote markers), whereas the remaining 0.7% were homozygous. In 2017–2018, 61% of SNPs were poly-high resolution, 27% were no-minor homozygote markers, and the remaining 12% were homozygous. All retained markers were polymorphic in at least one of the population sets tested in a given season. Averages of MAF for individual LGs ranged from 0.09 (4A) to 0.41 (2C), and 0.07 (4A) to 0.38 (2D) in 2016–2017 and 2017–2018, respectively. Preliminary GWAS analyses for all populations showed highly significant evidence for a single locus on LG 6 associated with AFR incidence (Fig. 2). Subgenome-specific FlexQTL™ analyses for the 2016–2017 discovery population showed evidence for a one QTL model (2lnBF10 = 32.9) in independent MCMC simulations using 1 as prior number of QTL (Fig. 3). Four different runs using from 5 to 8 LGs also showed strong evidence for a one QTL model (2lnBF10 = 28–30.3) in the same location. The QTL interval was consistently located at 54–57 cM on LG 6B. The phenotypic variance explained (PVE) by this locus across five runs averaged 50.7% in 2016–2017, and narrow-sense heritability estimates for the five runs averaged 0.46. 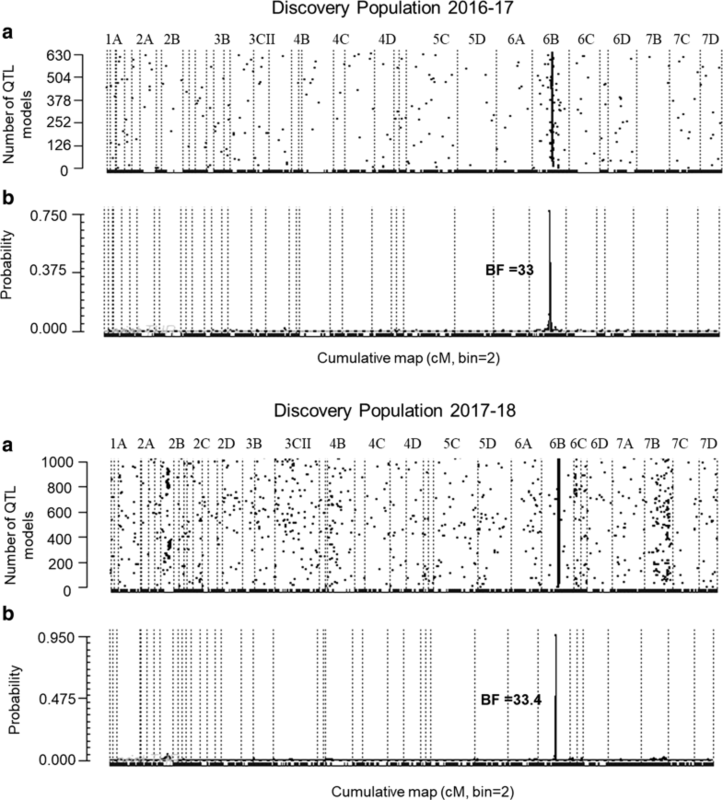 Genome-wide FlexQTL™ analysis results for the 2017–2018 discovery population were consistent with those obtained with the 2016–2017 discovery populations, with decisive evidence (2lnBF10 = 33.4) for one QTL on LG 6B (Fig. 3). The PVE in the second year was 94.3% with a narrow-sense heritability of 0.61. The locus found in this study appears to be distinct from the previously discovered Rca2 locus. Sequence-characterized amplified region (SCAR) markers linked to Rca2 (Lerceteau-Kohler et al. 2005) were blasted to the Fragaria vesca diploid reference genome (Edger et al. 2018). Reverse primers for marker CAC_240_2 and CAC_417_3 blasted to a distal portion of chromosome 7, whereas forward primers for marker CAC_240_2 did not blast to any part of chromosome 7. Additionally, marker CAC_240_2 mapped to the end of LG 7B in ‘Winter Dawn’ × ‘Treasure.’ Thus, two lines of evidence place Rca2 on a different chromosome from the novel locus described in this study. Associations for markers present in the QTL region were obtained for the discovery populations in seasons 2016–2017 and 2017–2018, and for the validation population in 2017–2018 (Fig. 4). Across all populations, the highest R-squared values correspond to SNP probes AX-89796486, AX-89838962, AX-89808208, AX-89838986 and AX-89896208 located between genetic position 54.53 cM and 55.85 cM on LG 6B of the genetic map. These positions correspond to the region between 21.51 and 21.97 Mb on chromosome 6 in the F. vesca reference genome. The SNP probe AX-89838986 had the highest average R-squared value across the two discovery populations and therefore was chosen as the most informative for examining allele interactions in all three populations (Fig. 5). In all cases, the heterozygous genotype aligns close to but not equal to the resistant homozygous genotype, indicating that resistance is conferred by a partially dominant allele at this locus. In summary, our results demonstrate consistent evidence that a partially dominant allele at a large-effect locus near 55–56 cM on LG 6B confers resistance to three C. acutatum isolates from Florida. The effects of the locus were validated in a set of advanced selections and cultivars. Furthermore, the locus occurs at a different genetic location from the previously discovered anthracnose resistance locus Rca2. We therefore name this locus FaRCa1 (Fragaria Resistance to C. acutatum locus 1). The FaRCa1 locus accounted for the genetic variation for AFR resistance observed in three field trials established across 2 years and inoculated with Florida isolates of C. acutatum. Together, the three trials represented the diversity of the UF elite breeding population. Leveraging historical recombinations and segregation among controlled crosses in large populations allowed the delineation of FaRCa1 to a region of 460 kb with high confidence. Single-marker analyses indicated that SNP probes AX-89796486, AX-89838962, AX-89808208, AX-89838986 and AX-89896208 located in the interval 54.53–55.85 cM on LG 6B have the highest associations with AFR resistance. These positions correspond to the region between 21.51 and 21.97 Mb on chromosome 6 of the diploid woodland strawberry F. vesca. These results will form the initial basis for marker development and marker-assisted selection for FaRCa1. Total phenotypic variation (PVE) and heritability estimates obtained from FlexQTL™ are genetic parameters inherent to the populations from which they were derived. Thus, differences in PVE (50.7% and 94.3%) and narrow-sense heritability (0.46 and 0.61) in the discovery populations of the first and second season are related to population structure and segregation of AFR. The discovery population in season 2016–2017 was composed of many crosses, some of which were resistant × resistant and susceptible × susceptible. In 2017–2018, putative heterozygous (Rr) resistant parents and homozygous (rr) susceptible parents were chosen to result in (1:1) segregation in each cross. Thus, the PVE should be larger in the second season, assuming a large effect for the locus. This was the case, despite the fact that the single inoculation and lower temperatures in 2017–2018 apparently limited disease progression in the field compared to 2016–2017, resulting in a lower overall AFR incidence in 2017–2018. Comparisons of disease incidence for parents, selections and cultivars in both seasons (Supplementary Table 2) reinforce the absence of genotype by environment interactions despite fewer symptoms observed in 2017–2018. A separate locus, FaRCg1, was recently discovered that confers resistance to C. gloeosporioides, the causal agent of Colletotrichum crown rot in strawberry (Anciro et al. 2018). This locus mapped to 66–70 cM on LG 6B. Therefore, FaRCg1 is located approximately 10 cM from FaRCa1 (Fig. 6), suggesting a cluster of Colletotrichum resistance loci on LG 6B. Further analyses are required to detect possible associations of alleles from these two loci that may influence simultaneous selection for both resistances. The FaRCa1 locus appears distinct from the Rca2 locus described by Denoyes-Rothan et al. (2005). This conclusion is supported by both physical and genetic mapping approaches. First, the CAC_240_2 and CAC_417_3 reverse markers linked to Rca2 (Lerceteau-Kohler et al. 2005) were located to chromosome 7 on the diploid woodland strawberry reference genome. Second, the CAC_240_2 marker from the same study was genetically mapped to LG 7B in ‘Winter Dawn’ × ‘Treasure.’ A third line of evidence distinguishing resistance mediated by Rca2 and FaRCa1 relates to recent advancements in the taxonomy of C. acutatum as well as previous research on pathogenicity groups. Sreenivasaprasad and Talhinhas (2005) described eight different molecular groups, A1–A8, within the C. acutatum species complex, which are pathogenic to strawberry and other plants worldwide. Groups A2 and A4 were dominant in Belgium; however, group A2 appeared to be more aggressive than group A4 to both strawberry fruit and crown of the cultivar Elsanta (Van Hemelrijck et al. 2010). 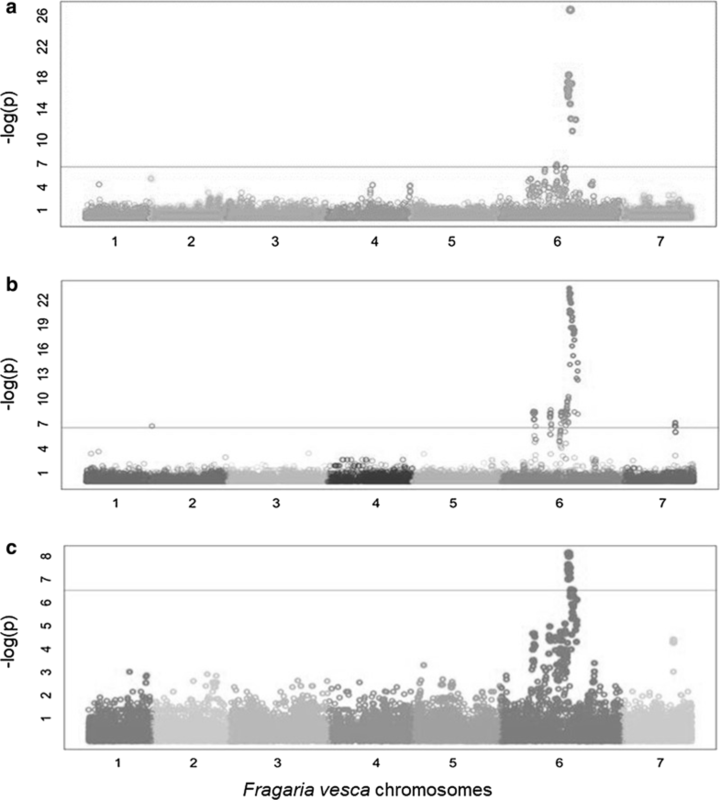 The presence of subgroups within the C. acutatum species complex was accepted and recognized using multi-locus molecular phylogenetic analysis of strains from numerous hosts with wide geographic distributions (Damm et al. 2012). Based on this analysis, previously described intraspecific groups were assigned to different species in the complex: A2 (C. nymphaeae and C. simmondsii), A3 (C. fioriniae), A4 (C. godetiae), A5 (C. acutatum) and A7 (C. salicis) (Damm et al. 2012). Preliminary phylogenetic sequencing analysis based on multi-locus sequence indicates that the vast majority of isolates from the C. acutatum complex in the USA belong to the species C. nymphaeae, followed by a small portion of isolates that belong to species C. fioriniae (Wang and Peres, in preparation). These C. nymphaeae isolates phylogenetically grouped with Goff, an isolate collected in the USA and assigned to PG-1 (Denoyes-Rothan et al. 2003). On the other hand, isolates 688b and 1267b collected in France and used to identify Rca2 are assigned to PG-2 (Denoyes-Rothan et al. 2005). The 1267b isolate shares highest multi-locus sequence similarity with isolates of C. simmondsii (Peres and Wang, in preparation). Therefore, our hypothesis is that FaRCa1-mediated resistance is effective against PG-1 isolates which correspond to C. nymphaeae and that Rca2-mediated resistance is effective against PG-2 isolates which correspond to C. simmondsii. Further work is needed to adequately test this potential association between pathogenicity groups and newly defined species in the C. acutatum complex. Without surveying additional isolates and broader strawberry germplasm, we are not yet able to form any hypotheses about selection for this locus during or subsequent to domestication. Currently, there are a small number of studies characterizing genes related to anthracnose resistance in strawberry. Casado-Diaz et al. (2006) reported spatial and temporal gene expression profiles after C. acutatum infection in different cultivars of strawberry. Pathogenesis-related (PR) genes encoding thaumatin-like proteins and hypersensitive-induced response protein had stronger or more rapid expression patterns in less susceptible cultivars. Also, genes encoding a β-1-3 glucanase, a class-1 chitinase, a peroxidase and two leucine-rich repeat (LRR) receptor-like proteins were down-regulated in infected fruit. In another study, Guidarelli et al. (2011) performed micro-array analysis in unripe and ripe strawberry fruit 24 h after their exposure to C. acutatum. Many genes encoding PR proteins were found to be up-regulated in both unripe and ripe fruit after infection. Also, genes coding for proteins involved in plant detoxification pathways and in the synthesis of stress-related flavonol and alkaloid compounds were up-regulated in both green and red fruits after inoculation. Future studies will locate candidate genes for FaRCa1 within the delineated region. In summary, a partially dominant allele at a major subgenome-specific locus, which we name FaRCa1, confers resistance to AFR in UF breeding germplasm when challenged with C. acutatum species complex isolates from Florida. Together with FaRCg1, this locus appears to be part of a group of Colletotrichum resistance loci on LG 6B. This resistance appears to be effective against PG-1 isolates, which we hypothesize are predominately C. nymphaeae, as opposed to Rca2 which is effective against PG-2 isolates. Strong and consistent phenotypic effects of FaRCa1 were detected across trials and validated in the parent pool of the UF strawberry breeding program and widely grown cultivars. These results should form the basis for breeding tools that will lead to more efficient selection for AFR resistance in the UF strawberry breeding program and other breeding programs utilizing resistant UF germplasm. NS performed phenotyping and analysis for the 2016–2017 and 2017–2018 seasons and prepared the initial manuscript; SV prepared the linkage map, provided guidance for QTL analysis and helped with analysis in both seasons; NP provided project and inoculation guidance and assistance; VW initiated the research and provided overall project and analysis guidance. All authors have reviewed and edited the manuscript. The authors acknowledge the strawberry breeding team at the Gulf Coast Research and Education Center for their assistance. Financial support for this project was provided through the Florida Strawberry Growers Association and the US Department of Agriculture/National Institute of Food and Agriculture Specialty Crop Research Initiative (SCRI) project ‘RosBREED: Combining disease resistance with horticultural quality in new rosaceous cultivars’ under Award Number 2014-51181-22378. This work was also supported by the SCRI project ‘Next-Generation Disease Resistance Breeding and Management Solutions for Strawberry’ under Award Number 2017-51181-26833.